Lovely ladies from 6ABC dressed the part for the Red Ball last year. L to R: producers Mara Webb and Kristie Gonzalez, health reporter Ali Gorman and anchor Monica Malpass. Main Liners can eat, drink, and be charitable at the Red Cross’ annual red-tie celebration featuring dozens of Philly’s top chefs! The American Red Cross Southeastern Pennsylvania (SEPA) Chapter will host the 11th Annual Red Ball on Saturday, March 6, 2010 from 8 p.m. to 12 midnight at the Please Touch Museum at Memorial Hall in Fairmount Park. 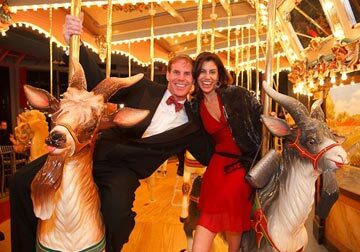 One of Philadelphia’s most popular winter galas is in its second year at the children’s museum, which makes for a lively setting. Julie Appolloni, Red Cross senior director of financial development, oversees every aspect of the event each year with her organization’s team. “It is like no other event in the city. The Please Touch is such a perfect backdrop too. It keeps the event light and festive and gives everyone the chance to dictate their night since it is not a structured party. And, undoubtedly, we always attract Philadelphia’s finest so expect the gala to sell out again—which it inevitably does each year,” enthused Appolloni. VIP ticket holders will enjoy one amazing all-access evening, beginning at 8 p.m. in the exclusive VIP Lounge, featuring renowned caterer Max & Me Catering. Other amenities include VIP express entry, private top-shelf open bar, cigar bar, separate coat check and a special VIP gift. Up to forty restaurants from across the Delaware Valley will be sampling their fine faire for the hundreds of guests to enjoy. 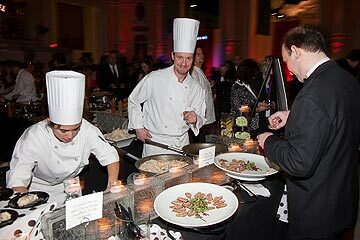 But, hands down The Red Ball’s biggest draw is the amazing sampling of culinary delights prepared by Philadelphia’s hottest chefs assembled through out the main museum hall. Each attendee will have a chance this year to vote for their favorite cuisine, a new, fun twist on the event. “We are bringing in some local celebrities, like sports radio personality Mike Missanelli, to be part of a celebrity panel of judges for the restaurant contest. The chefs take the gala very seriously too, so expect Philly’s top restaurants to pull out all the stops to make quite an impression on the guests,” explained Appolloni. Red Cross volunteers with their emergency vehicles are positioned outside the steps of the museum to greet the attendees and drive home the purpose of the night’s festivities. At the culmination of the night’s festivities, the attendees are served hot chocolate as they descend the museum steps to emulate the services the Red Cross offers in their relief missions. AML is proud to be a presenting sponsor of The Red Ball 2010. The Red Cross hopes to raise $250,000 from the eleventh annual gala. Guests at this red-tie event will sample culinary delights prepared by Philadelphia’s hottest chefs, dance the night away with entertainment provided by CTO World Entertainment Productions, enjoy access to the museum’s exhibits, mingle with Philadelphia’s social and business leaders, test their luck in the raffle and learn more about the mission of the organization and the everyday work of its volunteers. All Red Cross disaster assistance is free of charge and made possible thanks to the generosity of people throughout the Philadelphia region who donate their time, money and blood. The CEO of the Philadelphia Red Cross, Tom Foley, addressed that mission and the important goals of the Red Cross’s relief efforts. “We pulled the data on the average stay (of the people in Philadelphia) that ended up in a homeless shelter after a disaster, like a house fire, and it was more than six months. When the Red Cross is involved, that disaster recovery timeline is three weeks. And, that is not a criticism of the city’s shelter system. It is just an example that the Red Cross is set up to assist families with those comprehensive needs they experience during a disaster—get the kids back to school as soon as possible, help the parents return to work in a timely fashion. These are the challenges that our organization can handle and that is really what the Red Ball is all about. We all have a great time that night but know that the proceeds of the night are making an enormous difference for our neighbors across Philadelphia,” said Foley. The Please Touch Museum makes for a fun setting for guests to explore the museum’s exhibits while partying the night away! When: Saturday, March 6, 2010 8 p.m. to 12 p.m. Proceeds: All proceeds from The Red Ball benefit the Red Cross House, a one-of-a-kind short-term housing facility in West Philadelphia where hundreds of local families every year begin their recovery from fires, floods, and other disasters affecting their lives. Chef Contest: Attendees are encouraged to visit as many of the chefs’ tables as possible as they will be voting on their favorite restaurant of the night as they tour the party. The winning restaurant will be announced around 11 p.m.
AroundMainLine.com: AML is proud to be a presenting sponsor of The Red Ball 2010. Online Access: Attendees will be able to access Twitter and Facebook from a special area at the ball, via provided computers, to discuss the event live with their Facebook friends and Twitter followers! The Red Ball is one of Philadelphia’s hottest events and sells out every year. The Red Ball tickets are on sale now. Main even tickets are $175 and VIP tickets are $275. For more information about The Red Ball or to purchase tickets, visit www.theredball.org or call 215-299-5491. Sponsorships, restaurants and auction items are also still being accepted. If interested, please email redball@redcross-philly.org. Special thanks to official Red Ball photographer Paul Loftland. Interested in hiring Paul for your upcoming community event? Contact Paul at 856-229-5380 or email paul@paulloftland.com. Visit his website at paulloftland.com. « Mommy Martini Night: Recipes and More!